In some sociological and demographic respects, Palestine will have an easy adjustment. There will be other areas, though, that will serve to greatly complicate the emergence of a Palestinian state. Palestinians speak Arabic virtually universally. Differences in dialect are insignificant. Uniformity of language will contribute to the potential for success of the State of Palestine. Ninety-eight percent of the population of Palestine is comprised of Palestinian Arabs, though there are a few minor ethnic groups native to the area. Overall, ethnic homogeneity will be a positive element in the future of Palestine. Social structure and class present a somewhat more complicated picture for Palestine. Traditionally, there were simple but profound divisions. The wealthy merchant and landowning families, the so-called "Notables," represented the pinnacle of Palestinian society. The vast majority of the Palestinian population was relatively poor tenant farmers. Whatever bourgeoisie class existed was tiny and uninfluential. Huge changes occurred in the Palestinian social structure, as Arab nationalism grew, Jewish settlement increased, the Turkish empire disintegrated and was finally dismantled, Britain and France administered their resulting mandates, new Middle Eastern nations were formed, the State of Israel was founded, and major wars were fought between the Arabs and Israel. Large numbers of the peasant class were displaced, literacy increased, urbanization trends escalated, and a large body of displaced Palestinians was created--living both externally throughout the Middle East and the West, and in camps within the occupied territories, Jordan, and Lebanon. This cleavage has been greatly aggravated by the intifada experience. "Youths in their teens and twenties played the vanguard role," according to Don Peretz. They serve "not only as foot soldiers, but [as] leaders of the intifada." Since many of them come from the lower classes, from the villages and the camps, they bequeath a much more populist flavor to the uprising. 5 But they also contribute an anarchistic element to Palestinian society. The level and nature of participation of women in Palestinian society has changed dramatically in the past few decades, and increasingly since the beginning of the intifada. The absence of large numbers of Palestinian men, who left their families behind when they moved abroad looking for work, together with the thousands of men imprisoned by the military government over the course of the uprising, have forced women to expand their involvement into many traditionally male activities. Women have assumed highly visible roles as social, community, and political leaders, and have increasingly infiltrated fields once reserved for men, such as law, medicine, and engineering. 8 Recognizing the untapped reservoir of talent and energy that women represent, several of the Palestinian political organizations formed women's organizations to evoke and channel those resources. In certain respects, the situation much resembles that prevailing in the United States at the close of the Second World War. American women had filled many roles in industry, government, education, agriculture, and even the military, which had all long been strictly within the male domain. When the men returned from the war, women were expected to resume their traditional places in American society. But the "damage" had been done. Women had experienced the "outside world," as it were, and the seeds of the modern American feminist movement were sown. Though the resulting social transformation took several decades to blossom fully, the changes have been and continue to be profound. Dramatic social adjustments had to made in American society to adapt to the evolution of women's roles, exerting an equally profound impact on the role and self-perception of the American male. Though productive and necessary, the debate has been socially and individually disturbing, disruptive, and troubling. American men were, and often remain today, somewhat unsure of what their roles in society really are. It is likely that the place of women in Palestine has been set on a course that will alter it just as profoundly. Even if Palestinian society has by force of necessity become more open to changing women's roles than many other Moslem societies in the Middle East, the ongoing process is likely to be even more disruptive and tumultuous than it was for the United States. Expanding and opening the role of women in Palestine will theoretically have a broadening and liberating effect for the society as a whole, but the process will prove highly corrosive to social norms and traditional roles. Palestinian men, who had been full heirs to the venerable culture and tradition of the Arab male, will find the adjustments far more profound than did American men, who not only had several generations to get used to the idea, but started from a position nearer in concept to equality of the sexes. Up till now we have considered Palestinian society primarily from the perspective of the occupied territories, particularly the West Bank, giving a somewhat erroneous view uniformity in Palestinian experience. There are actually considerable differences across the entirety of the Palestinian people. Even within the territories this is the case. 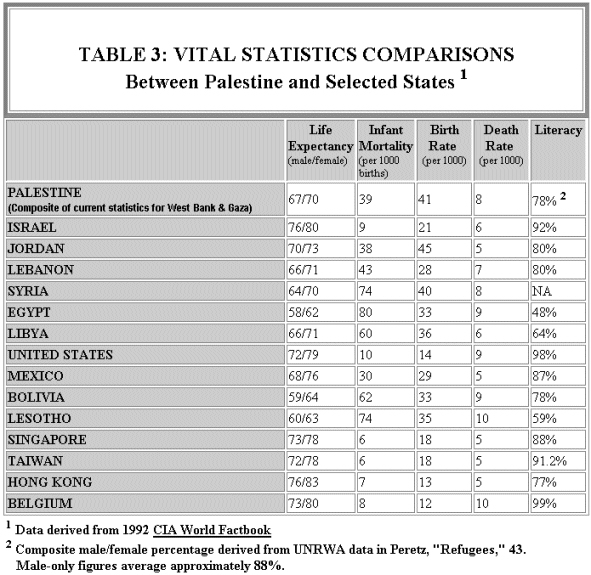 There are significant differences between Gaza and the West Bank, for example. Gazans tend to be poorer, less educated, and more inclined towards militantism and Islamic fundamentalism. This is at least partly the result of their cramped conditions, lack of resources, and peasant and lower-class origins. A majority of them are refugees. In contrast, people in the West Bank tend to be better educated, a bit more secular and cosmopolitan, and financially somewhat better off. Besides the occupied territories, there are also populations of Palestinians in other Middle Eastern countries. The largest of these is in Jordan. This group has increasingly integrated with Jordanian society, and as time goes on many of these people may come to completely identify with Jordan, and be less interested in consolidating with a Palestinian state. Palestinians had a large representation in Kuwait until the aftermath of the 1991 Gulf War, when their presence was considerably reduced by the Kuwaiti expulsion of large numbers of them. Significant Palestinians communities also remain in Lebanon and Syria, with lesser numbers scattered among a dozen other countries. Generally, the makeup of Palestinian communities abroad reflect a strong middle class, amounting to about 30% of the population, a small wealthy class, a broadly-skilled lower class, and a laborer class. 10 The development of sizeable middle and skilled blue-collar classes likely reflects the need for Palestinians to essentially "survive by their hands and wits" in countries where non-natives are not allowed to own real property. Nevertheless, experiences of each of the Palestinian communities has been different, ranging from periods of near-equal status in Jordan, to frequent suppression of Palestinian political and cultural activities in several other nations in the region. Resultant background, experience, skills and class mix would be very valuable to a Palestinian state, depending on how many of these expatriate Palestinians would be willing to "come home" to Palestine. There is, however, a potential for domestic discord inherent in the return of Palestinians from their "diaspora." Resentment between those who "toughed it out" in the territories may possibly develop against those who return, for having escaped the hardships of the Israeli occupation, while Palestinians from the diaspora may resent the "stay-at-home" Palestinians who were privileged to live in the ancestral homeland and avoid the frequent rigors of being unwelcome guests in countries that exploited them as marginal people. The bickering that could result would be at first potentially disruptive, but would fade with time as a common Palestinian identity is forged. On the surface, religion would seem not to be a major issue for Palestine. An overwhelming majority of all Palestinians are Moslems. Of these, 95% are Sunni Moslems. The relatively small numbers of Christians--which make up about 15% of the Arabs in the West Bank--live in general harmony with the Moslem majority. However, there is a strong resurgence in fundamentalist Islam that potentially could cause rifts in the social fabric of a future Palestinian state. Some of the most significant effects of this will be political, and will be discussed later under the Political Factor. The current revival of Islamic fundamentalism is a recent development, beginning its resurgence in the 1970's, and epitomized by Khomeini's takeover--and makeover--of Iran in 1979. Since then, it has gradually been making inroads throughout many Mid-East Moslem nations. At first, the Palestinian movement, with its focus on the secular PLO and the guerilla war, seemed relatively immune to Moslem fundamentalism. Fundamentalism could nevertheless be found among the Palestinians in embryonic form. Over the past several years many experts have warned that increasing repression by the Israelis, coupled with mounting frustration with Israeli economic and settlement policies would both drive more people into the fundamentalist camp and increase in degree of desperation the acts committed by Islamic activists. "Increasing support for Islamic fundamentalist factions among the Palestinians . . . is an indication of frustration with the impasse," which is demonstrated by Hamas' increasing strength and the growing occurrences of fundamentalist cooperation with "militant factions within the PLO which reject any form of political compromise." 12 (Washington, DC: Defense Intelligence College, Nov. 1992), 9. Other researchers warn that--though previous studies found that the secular nationalist movement was "overwhelmingly supported"--if the nationalist struggle fails to show concrete progress "support [could be expected] to be transferred to the Islamic fundamentalist movement," which would likely "shift its strategy to armed struggle and violent confrontation." 13 The increase in lethal violence perpetrated by Islamic fundamentalists against Israeli settlers and territorial officials beginning in the fall of 1992 shows these concerns to be prescient. By 1990, "interfactional fighting between the secular-nationalist groups and the Islamic fundamentalists" became "perhaps the greatest source of demoralization" for Palestinians in Gaza. Indeed, violent confrontations have erupted, in one instance so distressing the people of the community that to halt the fighting they physically intervened against both the religious and secular factions involved. Islamicist tactics upset many unaligned and secularist Palestinians. For example, in Gaza, where fundamentalism is more entrenched, members of Hamas have reportedly attacked with vegetable dye women deemed "inappropriately attired," creating resentment and sparking angry reactions. 15 In light of such confrontations and the growing power of the fundamentalist movement, the potential for a major inter-communal struggle between religious and secular factions once Palestinians have a state of their own may be great. The primary issue, which is already endemic and could escalate during the nation-creating process, would be the nature of the state itself--would it be secular or religious? An equally serious question would be what the relationship of Palestine to Israel should be--could the state give up any notion of having a literal claim on the whole of historical Palestine, and coexist peacefully with the Jewish state? Or would the religious imperative strive toward uniting all of the land west of the Jordan under one Islamic banner? The very nature of the controversy would make a compromise solution difficult. While secular approaches (with Marxism a possible exception) tend to be open to compromise, absolutist religious views--especially on the part of the more ardent fundamentalists--could make things very sticky indeed. It is possible that serious societal conflict could arise, resulting in the extreme case of a traumatic civil war that would directly threaten the survival of the Palestinian state. There are two factors that may work to mitigate the religious-secular dichotomy. First is the nature of the growing support for fundamentalism in the first place. Since many Palestinians-- frustrated at the lack of progress towards accomplishing their nationalist goals--appear to be gathering under the fundamentalist banner "because they [can] see no other solution to their plight," 16 there is great likelihood that they will moderate their zeal and gravitate back toward secularism once their goals are achieved. In such an event, religious fundamentalism would by no means disappear, but it would become far less influential in the political and social life of Palestine. A second modifying factor would be a possible moderating trend in fundamentalism. As one expert points out, "not all Muslim religious leaders oppose peace negotiations and not all fundamentalists" are rejectionists. 17 Another observer notes that one group, the Muslim Brotherhood (out of which Hamas originally grew) has had "broad success in recent years building a nonviolent Islamic political movement willing to work within Israel's democratic political system." 18 If this sort of approach is continued by this and other groups inside Palestine, a workable secular-religious pluralism might be achieved. Education was seen as a ticket out of the frustrating and oppressive situation in which many Palestinian families found themselves--and so it proved to be for many. "Without land, [Palestinians] have only education as a capital asset." 21 But as a consequence of the intifada and the Israeli response to it, the Palestinian educational edge in the territories is being blunted. Beginning in 1988, schools throughout the occupied territories have often been closed, often for periods running to several months. Though the Israelis may still close schools in reaction to demonstrations or riots, primary and secondary schools have been reopening sporadically since 1989. Colleges and universities, however, only began reopening in 1992. Schooling in the territories had already suffered over the years from the policies and neglect of the Israeli military government. 22 As a further result of the missing months and years of school, literacy, knowledge base, and study skills of Palestinian students have severely declined. Children and young adults who have been at the forefront of demonstrations and confrontations with Israeli troops, and seen their family structures erode as a result of the intifada, have lost respect for teachers' authority. And the school infrastructure has suffered equally. Buildings have deteriorated, new buildings have not been erected to cope with the growing student-age population, and facilities, equipment, and textbooks have fallen into disrepair and obsolescence. Having an entire generation of students who are as much as five years behind in their education represents a huge deficit for Palestine's human resources. The picture is, however, not altogether bleak. Even during school closures, for example, UNRWA kept teachers on full salary to promote as much as possible the schools' quick recovery whenever they reopened. 28 Teachers in the territories also tried the best they could to provide alternative schooling, though such measures usually met with mixed results at best. And, once again, education is coming to be seen as the gateway to escape powerless and indigent circumstances--the primary "capital assets" to which Palestinians have access. Teachers, leaders, and parents are working to slowly correct the situation. The intifada leadership has taken steps to restore the education system, by decreeing that students and teachers be exempted from participating in general strikes 29, and by demanding that factional rivalries and men wearing masks stay away from schools. 30 And there remains a well-educated strata among adult Palestinians. Regrettable as it was, the mass expulsions from Kuwait after the Gulf War brought an influx of many experienced and literate Palestinians into Jordan, half of whom had university degrees. 31 If these resources sometime soon become accessible to the State of Palestine, they will be invaluable. A people's native motivation and determination play an extremely important role in the success of the nation to which they belong. Though unmeasurable by standard instruments, there are indicators that can give us an idea as to the presence and depth of these important qualities. Some of these indicators include endurance under adversity; individual willingness to sacrifice for the corporate good; innovative solutions for surmounting obstacles; communal cooperation; and perseverance against opposition. If these qualities are not present originally, they may often be brought out by challenges and trials that are uniformly imposed upon most or all of a people either by unfortunate circumstance (drought, famine, earthquake) or by an outside human agency (aggression, oppression, suppression). These qualities exist among the Palestinian people. Perhaps the intifada is the best example of this. The spontaneity and universality demonstrated at the very beginning showed plainly the thoroughly-grassroots basis from which the intifada arose. That the intifada continues despite imaginative, and sometimes almost drachonian Israeli countermeasures shows an amazing strength of resolve. The spirit of cooperation practiced by merchants, students, workers, teachers, women, farmers--all the different segments of the Palestinian community--in supporting the intifada's leadership in strikes, demonstrations, and coping strategies is a further demonstration of Palestinian determination. The very concept of sumud--"steadfastness," or "solidarity"--in the face of the occupation, implies character and strength of will. It implies a growing sentiment of "we must all hang together, or we shall hang separately." The intifada is not the only evidence of the strength of Palestinian character and will. The fact that the PLO continues to exist, despite the rampant factionalism within the Palestinian's own ranks and attacks by Israel and various Middle Eastern governments testifies to the determination that underlies the Palestinian movement, despite its internal differences. Even the notorious, often ruthless guerilla operations of the PLO and other radical Palestinian groups bears testimony at least to this determination. Of course, one might ask whether Palestinian steadfastness developed because of national character and will, or whether character and will developed as the Palestinian people confronted challenges, dangers, and perceived subjugation. In the end, the answer to this question doesn't really matter--the end result is fundamentally the same. It is ironic that the hardships the Palestinians endure because of deliberate Israeli attempts to stifle national identity may instead actually serve to reinforce it. The very attempts to quash Palestinian identity and independence seems to create a "refining fire" that anneals and tempers the Palestinian identity so that it can withstand the rigors of the birth and the development of its own nation-state. A possibly serious socio-demographic problem is the sheer size of the potential Palestinian population in proportion to available land. Thanks to the numbers of Palestinians leaving the occupied territories in past years in search of greater opportunity and better jobs elsewhere in the Middle East, Europe, and the United States, the population of the West Bank and Gaza had not increased anywhere near the rate that might be expected given the chronically high Palestinian birthrate. Nevertheless, based on today's estimated population for both West Bank and Gaza of approximately 2.265 million, 33 and given a state that included the approximate area of the West Bank and Gaza (6020 square kilometers 34), Palestine's population density would reach about 376 people per square kilometer. Once a state is founded, however, many Palestinians in the diaspora would likely return almost immediately. Estimates range to as many as 750,000 Palestinians abroad that might return to the new nation, rapidly making conditions more cramped, with densities of about 500/km2. 35 In the unlikely event that most, or even all of the expatriate Palestinians were to return, the population would certainly exceed four million, creating a density approaching 660 persons per km2. For comparison, population density in Israel is 233 per square kilometer; in Japan it is 329/km2; in the US it is just over 27/km2. 36 While other places sometimes thrive with high population concentrations (the Netherlands, at 405/km2; Hong Kong, at an incredible 5949/km2), such places are inevitably blessed with a highly fortuitous location and/or far better and more available resources. The densest population in Palestine is in the Gaza strip area (approximately 2034 people/km2). The balance of the population occupies the western-most two-thirds of the West Bank. Four "urban centers" are the focus of Palestinian population: Jerusalem, Nablus, Hebron, and Gaza. Nine major towns, among them Bethlehem, Jenin, and Jericho complement the larger cities. There are a number of suburban communities, and numerous rural and semi-rural villages and towns. Except for the relatively more difficult terrain above the Jordan valley and bordering the Dead Sea, settlement patterns are fairly uniform. With the establishment of Palestine, a program would have to be instituted to both alleviate the seriously overcrowded conditions in Gaza and some of the more congested urban areas, and to intelligently provide for the re-settlement of expatriate Palestinians returning to the new state. Properly managed, this program could maximize the integration and use of the country's human resources, and minimize the negative effects of a densely-settled population. High population densities are not necessarily a threat to a nation's viability. Much depends on the infrastructure, political organization, and economic circumstances of the country. In fact, modern development requires population concentrations to facilitate business and industrial production. High population densities are most problematic in countries that rely heavily on agriculture--the large areas required for dwelling places, roads, and public and private facilities can seriously encroach upon productive agricultural land, and make heavy demands on limited water supplies. One of Palestine's few natural resources is its farm, orchard, and pasture lands. These are particularly valuable resources in a region in which such things are otherwise in short supply. Presently, there remains marginal and unproductive land that might be used for settlement. Still, population growth and distribution will need to be managed to insure valuable resources are not destroyed just to find room for everyone. Healthcare is complicated by the fact that only 34% of Palestinians are covered by insurance, and many of those not covered have no access to medical care because of the expense. Distribution of facilities is also problematic, with one 1988 study reporting that 56% of population centers in the West Bank have no local health centers, and 57% have no maternal and child health clinics. All in all, the same study concluded that the Palestinian healthcare system "suffer[ed] from shortage in manpower, material and equipment resources." 38 There are many maladies and health deficiencies that will disappear once the system is adequately expanded and resourced. Yet, despite its shortcomings, Palestine's health profile puts it moderately better off than most Third World and developing nations, if worse than most industrialized Western ones. Palestine has an extensive recent tradition of concern about healthcare, and the beginnings of a healthcare infrastructure that, if it is oftentimes inadequate for the population it presently serves, can at least act as a jumping-off point for the development of a well-established and competent system. Three elements form the foundation to Palestinian health care: the Palestine Red Crescent Society, UNRWA medical infrastructure, and health services within the territories. The PRCS was founded prior to the 1967 war in Salt, Jordan as the "Fateh Medical Services" to cope with the low-level of health care provided the Palestinians. It became the PRCS in 1968, and within two years had an infrastructure consisting of several hospitals, numerous clinics and pharmacies, training facilities for medical personnel, and large stores of medicines and other medical supplies. The society developed chapters in Egypt and Kuwait as well, though the Kuwaiti chapter functioned more as an auxiliary, supporting medical education and raising funds. It is clear that Palestine is in need of healthcare professionals and added infrastructure if it is to provide a satisfactory level of care for its population. Yet it is, at least, not starting at the bottom. Properly managed and resourced, Palestine can develop a robust, comprehensive health care system in a relatively short period by combining what is already in the territories with the resources available in the Palestinian diaspora, and augmenting it intelligently with funding and support packages from contributing nations. Precisely defining quality of life is difficult, perhaps impossible. As mentioned in the opening chapter on the Factors of Viability, it is a blend of all the elements of a society, from education and healthcare to cultural events and adequate employment opportunities. The fact that it defies precise definition does not mean, however, that it is not an important element in the survivability of a nation. Two factors are important with regard to the concept of "Quality of Life"--perception and reality. Of these, perception is the most significant. How a nation is affected by its quality of life is directly related to the population's perception of how good life is or is not. If a population with relatively poor quality of life is unaware that it is possible to have better, the population will accept life as experienced. If, on the other hand, a population with a relatively good quality of life in absolute terms has the perception that the quality of life is inadequate, and can and should be improved, the population will be restive, demanding, perhaps unruly or even disruptive. Reality--as represented by quality of life as it really is, rather than as it is perceived to be--is only important when one society or culture butts up against another and there is opportunity for comparison. It is at this point where have-nots discover that they, by their lights, are being short-changed, and dissatisfaction begins. While dissatisfaction with quality of life seldom in itself brings about a nation's collapse, it can be the catalyst that sparks a chain of events that can bring collapse as a result. In Palestine's case, rising and falling expectations will play a significant role in the inner stress and turmoil of the state. Just by living in close proximity to cosmopolitan Israel, the expectations of Palestinian youth have been raised dramatically. They see the consumer goods, the freedom, and the opportunities their Israeli counterparts enjoy, and are frustrated--not only that they don't enjoy similar advantages, but that there is no hope that they will enjoy them. These frustrations certainly played a role in the spontaneity of the intifada, and probably are an element in the increasing flirtation with Moslem extremism and violence currently taking place in the territories. The State of Palestine will have an instant built-in advantage when it comes to quality of life perception. Just the mere fact of its creation, bringing with it the lifting of onerous restrictions imposed by the military government, will cause an immediate impression of dramatically improved quality of life. If Palestine takes immediate steps to follow up with progressive initiatives to build the state politically, economically, and socially, quality of life will continue to improve. The development programs initiated by the Palestinians themselves and through aid from other nations will continue to improve conditions. As long as quality of life is perceived to be improving in a reasonable fashion, much social turmoil can be avoided. In the end, Palestine will necessarily pass through a transition time of turmoil and social disruption. But the socially corrosive forces created by the intifada, Israeli occupation, and diaspora may be the very factors that make it possible for Palestine to become a successful, modern state. In order for it to survive, it will have to both integrate and compete economically, politically, and socially with the greater world community. Too strong an influence of the traditional and archaic could be life-threatening to the state. The upheaval and social re-ordering through which Palestinians have and will continue to pass may be the catalyst that allows the transformation into a viable, survivable nation. Population is nearly 100 percent Arab. Growing populism; family still strong but weakening; change in women's roles a disruptive force, but can yield human resource windfall; diversity among experience and backgrounds provides social potential, but could produce divisions; wide experience, education, and cosmopolitan influence of returnees could be valuable resource; youth in upheaval. Overwhelming majority of Moslems is an advantage; growth of Islamic fundamentalism a disadvantage. Widespread positive attitude toward education, plus venerable educational heritage work for advantage; disruption of education during intifada and Israeli neglect a disadvantage. Sumud, Innovation, determination, and perseverance through hardship. High density and crowded conditions can make life difficult, and require significant resources; population distribution, labor supply, and population concentration is conducive to commercialization/industrialization. Well-established health care tradition; established resources; but resources inadequate for population size and relatively unavailable to poorer sectors. Quality of life is low currently; rising perceptions with statehood; properly managed infusion of development resources will continue to raise standard of living. John P. Richardson, The West Bank: A Portrait, (Washington, DC: The Middle East Institute, 1984), 90. Manuel Hassassian, dean of the arts faculty, Bethlehem University, quoted in David Hoffman, "The Intifada's 'Lost Generation,'" The Washington Post, 7 December 1992, sec. A28. Naseer H. Aruri and Samih Farsoun "Palestinian Communities and Arab Host Countries," in Khalil Nakleh and Elia Zureik, eds, The Sociology of the Palestinians, (New York: St. Martin's Press, 19080), 129-138. Mohammed Shadid and Rick Seltzer, "Growth in Islamic Fundamentalism: The Case of Palestine," Sociological Analysis, 50, no.3 (Fall 1989): 291, 294-297. Mohammed Shadid and Rick Seltzer, "Growth in Islamic Fundamentalism: The Case of Palestine," Sociological Analysis, 50, no. 3 (Fall 1989): 297-298. Emile Sahliyeh, In Search of Leadership: West Bank Politics Since 1967, (Washington, DC: Brookings Institution, 1988), 126-127. Sara Roy, "The Political Economy of Despair," The Journal of Palestine Studies, 20, no. 3 (Spring 1991): 58-69. Sara Roy, "Changing Political Attitudes Among Gaza Refugees," Journal of Palestine Studies, 19, no. 1 (Autumn 1989): 77. Jackson Diehl, "Israel's New and Daunting Foe: Radical Islam, in a Holy War to the Death," The Washington Post Weekly Edition, May 25-31, 9. David Hoffman, "The Intifada's 'Lost Generation'," The Washington Post, December 7, 1992, A28. Milton Viorst, Reaching for the Olive Branch: UNRWA and Peace in the Middle East, (Washington, DC: Middle East Institute, 1989), 55. "Masterplanning," 18. There are a number of population estimates for the territories. This figure, the highest, was selected as one of the most realistic, but also as a "worst case" scenario. Central Intelligence Agency, The World Factbook 1992, (Washington, DC: GPO, 1992), 123, 372. Mark A. Heller, A Palestinian State: The Implications For Israel, Cambridge. MA: Harvard University Press, 1983, 83. Figures are derived from individual country entries in the CIA 1988 Factbook. Vital statistics are derived from the various country headings in CIA, "World Factbook." Jamal R. Nassar, The Palestine Liberation Organization: From Armed Struggle to the Declaration of Independence, (New York: Praeger, 1991), 70-71.